Acrylic – or silicone – render is a flexible anti-crack render with a high polymer content and alkali-resistant reinforcement. Its flexible formula means acrylic renders create a flawless finish that can last for decades with minimal maintenance and care. Our render uses high quality acrylic pigments to protect your building from solvents, pollutants and ultraviolet light from the sun. Acrylic renders are commonly used to refurbish properties with a history of substrate cracking and as the external finish on newer buildings. Thin coat acrylic renders are ideal for large properties where maintenance could be an issue. The flexibility of acrylic renders means we can cover large areas to a perfect finish and it will stay that way for years to come. Special acrylic pigments protect your render from the harmful ultraviolet rays from the sun and keep the colour of your render consistent. 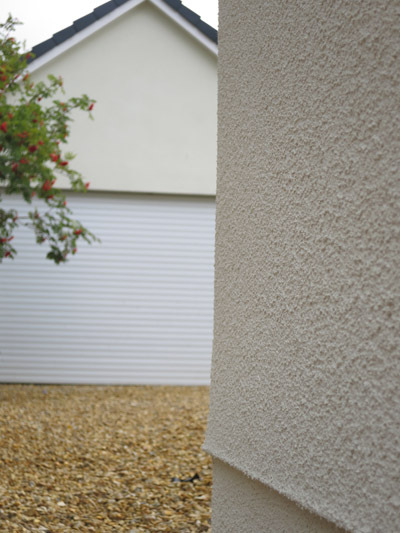 We can manufacture literally any colour of thin coat render for a flawless contemporary finish. The McQ Plaster Company has been plastering properties the length and breadth of Scotland for the past six years. Over that time we have developed a unique application method that marries traditional craftsmanship with the latest available technology to achieve exceptional results for every single client.